King's Towing Atlanta is the Metro Atlanta's original motorcycle towing Professional s providing 24 Hr emergency roadside services 7 days a week! As Motorcycle riders and true enthusiasts ourselves, we fully understand the pride and care given to your motorcycle. Our experienced staff follow stringent motorcycle loading practices and towing procedures ensuring that your motorcycle is transported safely and professionally with No scratches No excuses 100% Satisfaction Guaranteed! King's Towing Atlanta provides our private and commercial customers a damage free motorcycle towing solution. Our company uses patented designed attachments and custom fabricated equipment which guarantees damage free loading and unloading of your motorcycle. Our state of the art equipment and exclusive patented attachments, include the industry leader the Condor Motorcycle Loading System, this proven system eliminates the potential of your bike from tipping over during the loading and transporting process. 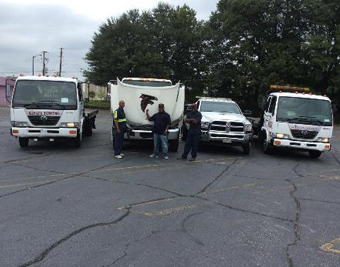 King's Towing Atlanta is certified by the Atlanta Department of Public Safety and the Department of Transportation, we are fully licensed, bonded and insured. Provided for your convenience is a detailed list of our current rates and services.